The annual Crabfest in Salcombe, celebrating crab and all things seafood, meant that the town was buzzing more than usual as the Rotary Club hosted its second successful festival. The winning combination of a small group of business people whose aim is to raise monies for local charities, under the banner of The Rotary Club, pulled off another amazing family, seaside carnival day out. One happy attendee was Emma Tozer, from Kernborough, who won the coveted Marchand Petit hamper full of Salcombe goodies. She was presented with her prizes the following day after winning the company’s prize draw. Harriet Cundy, Director, was delighted to hand over the brimming casket full of local treats and produce. She commented: “We were generously supported by well-known and award winning firms such as Salcombe Gin and Salcombe Brewery, along with treats such as the delicious homemade tangerine, vanilla and ginger marmalade from Old Walls, a well known local jam maker from Combe, on the outskirts of Salcombe.” In fact, all the fudge, chocolate and spirits couldn’t fit into the one basket. 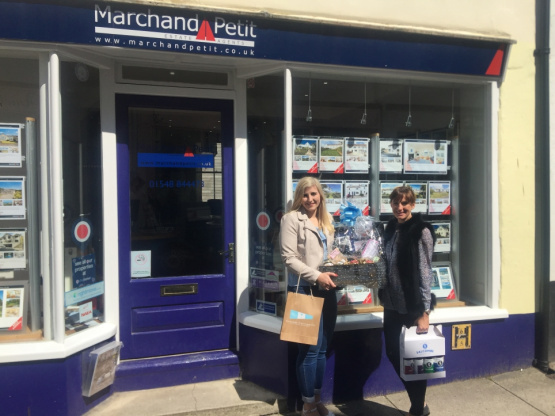 The Galley Girls, renowned for their South Devon based catering business, provided their mouth-watering crab pate to accompany the Prosecco enjoyed by visitors, old and new clients and residents who called into Marchand Petit’s Salcombe office on the main high street. Where they sold out of the pots of pate available also to buy on the day. For further information, please contact Marchand Petit’s Salcombe office on 01548 844473.